Street Fighter V is set for a huge update in the next few days. On September 22, the game will get a new character in Urien, a new game mode in Vs CPU (which strangely wasn’t already in the game), new Daily Targets, and some awesome-looking new Environmental Stage Knock Outs for a number of arenas. Players will also get some new colour bundles for character customisation, and the update will also address some minor gameplay and online issues. Here’s the full list of updates coming to the game later this week. 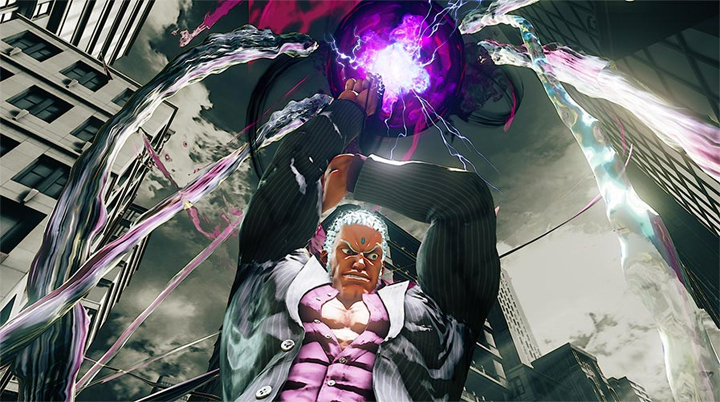 As mentioned in our blogpost earlier this month Urien will be blasting on the scene with this new update. The Vice President of the Illuminati can be purchased with Fight Money or via the Steam and PlayStation store. Season Pass holders can hop into a match with him as soon as the update goes live. New Daily Targets will be available to help you earn extra Fight Money to purchase additional content. Fight in a ranked match to earn 1000 Fight Money. Spend a little time playing in training mode to earn an additional 500 Fight Money. Each Daily Target has a time limit so don’t forget to log in and cash in on these. Rewards will range between 100 and 5000 Fight Money. Versus CPU mode will be added as another option to standard versus mode. Now you can slug it out with the AI of varying difficulty and sharpen your skills before challenging friends or others online. Fighter Profiles will also be updated and stat tracking will go live! Now you can dissect your gameplay to find and eliminate bad habits or simply show off your skills to friends. Color bundles will be available for purchase with Fight Money or via the Steam and PlayStation stores. Check out the following list for content and pricing. New environmental stage KO’s will be added for the list of stages below. If you loved blasting other players through doors and dropping bowls of noodles on their heads, just wait until you see what we have in store with this update. The issue which added an additional frame of lag to PlayStation 4 fight sticks on PlayStation 4 has been identified and patched. Now input time is unified across PlayStation 4, legacy controllers and PC. Juri’s V-Reversal was unintentionally able to hit downed opponents under specific circumstances. Juri’s V-Reversal was corrected so that it cannot hit downed opponents. Juri’s invincibility during her V-Reversal was unintentionally short. This was corrected by setting the invincibility on Juri’s V-Reversal to 14 frames after the hit box of the move disappears. When Ibuki was hit during a crouching fierce, she would unintentionally go into a standing state damage animation. This has been corrected so that when hit during a crouching fierce, Ibuki goes into a crouching state damage animation. The light version of Yoga Sunburst would fire regardless of whether the player was holding down punch or not. This has been corrected so that when the charge portion of L Yoga Sunburst is guarded, holding down LP will maintain the charge motion. When the tip of jumping LP hits an opponent or is guarded during Dhalsim’s V-Skill, the Critical Art gauge would increase rather than the V-Gauge. This has been corrected so when a jumping LP hits an opponent or is guarded during Dhalsim’s V-Skill, it now builds V-Gauge. When Dhalsim performs an airborne Yoga Teleport against an opponent on the edge of the screen and performs a jumping attack afterwards, the jumping attack would be performed in the opposite direction of the opponent. The directional determination after Dhalsim appears from an airborne Yoga Teleport has been corrected, making it more difficult for this to occur. Under certain circumstances, moves that only hit opponents in a standing state would unintentionally miss during certain standing states. This has been corrected. The hurtboxes on characters recovering from getting hit out of the air, allowing moves that are designed to hit standing characters to properly hit. Additionally throw attacks that normally miss on crouching characters will no longer be able to connect on characters recovering from getting hit out the air as they transition to a crouching state. After the attack frames of Birdie’s jumping LK ended, Birdie’s hurtbox would unintentionally remain absent in his recovery frames until he landed. This has been corrected by setting a hurtbox to Birdie’s jumping LK recovery frames, until he lands. Currently, the game counts a disconnect between the “Another fight is Coming Your Way” screen until you pass-through the results screen by selecting “find another match” or “exit to main menu”. The range a disconnect penalty will be assessed will be changed to be between from when “Another Fight is Coming Your Way” to after League Points (LP) and Fight Money (FM) have been calculated on the “Results” screen.